In my current administrative position, I am still not authorized to evaluate teachers. Recently, however, I attended a meeting with other administrators where we learned about how to conduct an evaluation meeting with a teacher. I took good notes, seeing that eventually I will have to conduct such meetings. Assuming you have already observed a lesson delivered by the teacher, you’ll schedule a meeting with the teacher where you will discuss your observations. You’ll be basing your meeting on the Teaching Standards developed by your state education department. Once you sit down with the teacher in your office, here is a quick outline of how a successful teacher evaluation meeting can look like. You have to make this meeting as non-threatening as possible. It will already be a tense atmosphere, but you can ease that tension with a few comments about the photos of the family, the room décor, etc. Try to be sincere about your comments. Once the small talk is over, explain to the teacher the purpose of this evaluation. Remember, you are there to serve as a teacher coach – not a teacher judge. Ask the teacher what he/she thought about the lesson. Was it successful? Could it have been improved? Explain in detail what you saw when you were in the class. Here’s where you tell the teacher what you liked about the lesson. Talk about a lot of things, but focus on the one or two specific actions that you would like him/her to continue. Ask him/her what he/she would change if he/she had a do-over. Here is where you start talking about the areas of concern that you observed in the class. There might be a lot of actions that need to be corrected, but what I learned is if you talk about everything, you dilute the effect of the meeting. Focus on one or two areas of concern. Remember that you are coaching – not judging. Also, remember that the teacher in your office is a professional with pride, so it can’t be a parent to child conversation. It’s a team member to team member conversation. There will be times when the teacher is so bad, that you’ll have to have a parent to child conversation, but for most teachers, that won’t be the case. You can’t just say, “Do better next time.” You have to give specific actions that the teacher can take next time. Teachers want practical ideas to use in the classroom. Give them some. Unfortunately, one negative word can delete a hundred positive words. It’s important to end the meeting discussing the positive actions that you want the teacher to continue. The teacher may be focusing only on the criticisms, but you have to remind him/her of the positive examples of teaching that you observed. Make it clear to the teacher that he/she is a valuable asset to the school. 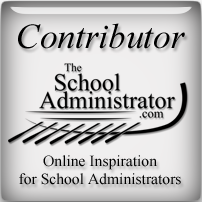 I know that there is so much more to the process than I have described, and I would welcome any suggestions or advice from seasoned administrators. I’m hoping that all the teachers that I will have to evaluate are awesome teachers with nothing to improve on, but I know those perfect teachers don’t exist. I was the last one, and now I’m in administration. HA! Just kidding.